The small log cabin designs featured here are ideal for weekend getaways and vacation retreats. Nestled in rustic wooded settings, they provide a vast array of opportunities to enjoy the out-of-doors any time of the year! On the edge of the expansive western Montana wilderness, Abbott Valley Homestead (left) offers historic log cabin and guest house rentals that are rustic, yet cozy and comfortable. Located near Glacier National Park, they provide an ideal base camp from which you can hike, bike, fish, golf, and swim . . . . . or just relax! Mount Assiniboine in British Columbia, Canada, provides a dramatic backdrop for the small log cabin in the peaceful winter scene below. The lovely guest cabin pictured below, with its great stone hearth at right, is located in Ontario, Canada. It was designed by Locati Architects -- one of the premier architectural design firms in the United States -- based in Bozeman, Montana. The talented folks at Roger Wade Studio are credited for the photos of this delightful structure. Pictured at right and below is another charming log cabin in British Columbia, Canada. Built in 1986, this tiny storybook design, which features a loft, is only 241 square feet in size. It would make a great weekend getaway or retreat! The quaint cabins at right and below are located in Otto, North Carolina. Nestled in the Blue Ridge chain of the Appalachian mountains, they are available as guest rentals. 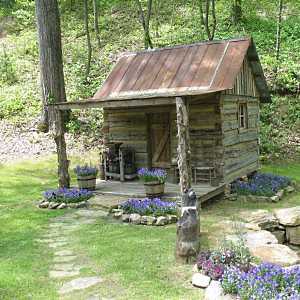 Operated by Turnstone Log Cabin Rentals, they feature hand-hewn craftsmanship. Massive hemlock logs with dovetail notched corners and chinking, exposed ceiling beams held in place by wooden pegs, a sleeping loft, pine floors and tin roofs form these Appalachian style small log cabin designs. You get all the charm of the 1700s and 1800s, but with all the conveniences of today! And finally, the little log cabins pictured at right and below are also guest rentals. Part of Dunton Hot Springs Resort, they are nestled deep in the Colorado Rockies. Just across the mountain from Telluride, Dunton Hot Springs Resort is a romantic ghost town that has been lovingly restored, set in an extraordinary alpine valley. Sturdy, hand-hewn and authentic, the cabins contain a world of whimsy and elegance. Built in a circle around the Saloon and Dance Hall, they lie just steps from a wonderful bath house. At the other end of town is an open air chapel and a tumbling waterfall. Please check back often or subscribe to our RSS feed, as we frequently add new images of small log cabin designs to our site.